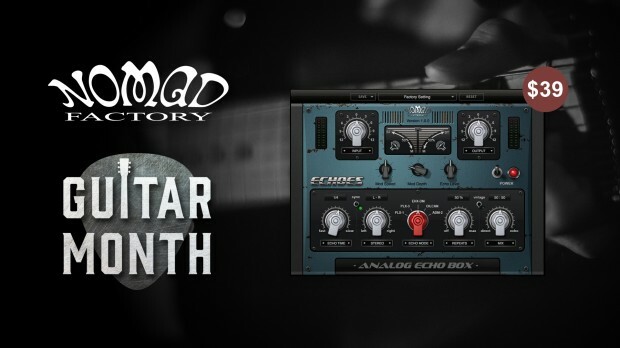 Nomad Factory’s Echoes is the essential guitar effect plug-in. Everyone needs a great tape delay to get their tracks slapping along to the rhythm. Only $39 right now! (List $129). Get Nomad Factory’s Echoes Here for only $39 ! ECHOES faithfully models the greatest delay effects of all time, PLX-1 based on Echoplex 1, PLX-3 based on Echoplex 3, OILCAN based on Tel-Ray Oilcan Delay, EHX-DM based on Electro Harmonix Deluxe Memory Man, and ADM-2 based on Boss DM-2 Analog Delay. This entry was posted in DontCrack, Plug-ins, Promotions and tagged Boss DM-2 Analog Delay, Echoes, Echoplex 1, Electro Harmonix Deluxe Memory Man, Nomad Factory, Tel-Ray Oilcan Delay. Bookmark the permalink.